You likely already know that the 2016 Jeep Cherokee gives drivers a wide selection of safety features to keep you and your passengers safe. At the same time, you are probably well aware that this vehicle is embedded with technologies to keep everybody on board entertained and informed throughout drives both long and short. However, did you know that the Jeep Cherokee is also a startlingly powerful vehicle, too? Read on for some of the details regarding this new Jeep’s performance features. First of all, you’ll get a choice of two engines. On the one hand, you could go for a 2.4L I4 MultiAir and 2.4L I4 PZEV M-Air engine that gets 184 hp as well as 171 lb-ft of torque while guaranteeing top-notch rates of efficiency (31 mpgs on the highway, for example), as well as 489 highway miles on a single tank of gas. On the other hand, you can opt for a 3.2L V6 24-Valve VVT engine with Elect Stop Start capabilities that generates 271 hp and 239 lb-ft of torque while also ensuring remarkable efficiency rates. Meanwhile, the Jeep Cherokee can lug as much as 4,500 pounds in total when equipped with its Trailer Tow Group package, making it possible to drag all but the heaviest loads to the beach, lake, or just around town. Likewise, the Cherokee’s Start-Stop technology makes it possible for you to control the amount of CO2 the vehicle outputs, thus guaranteeing you an even cleaner drive than ever. 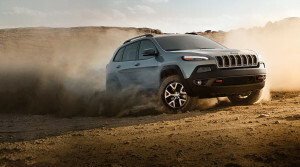 Finally, the Jeep Cherokee gives you a selection of driver assist programs, ranging from Selec-Train (which promises improved traction control), to Selec-Speed Control (for a performance boost on hills), to a 56:1 crawl ratio and standard skid plates. Test Drive the 2016 Jeep Cherokee Today! Best of all, you can test drive the 2016 Jeep Cherokee today by visiting out Sorg CDJR dealership. Located at 1811 Elkhart Road in Goshen, we can always be reached via telephone at 574-533-8605. On the other hand, you can also simply complete and send to use this easy-to-use online form, and we’ll get back to you pronto. Don’t wait: experience epic performance in the 2016 Jeep Cherokee today!